The Studio Live mixer revolutionized the workflow for live FOH engineers. The new FaderPort 16 should do the same for engineers and mixers. This USB 2.0 interface gives the user a hands on mixing experience in only the way Presonus does. Baton Rouge, Louisiana—January 2018… PreSonus® is now shipping its feature-rich, easy-to-use FaderPort™ 16 Mix Production Controller, which connects via USB 2.0 to provide precise tactile control over your favorite DAW’s mix and automation functions, including complete transport control. 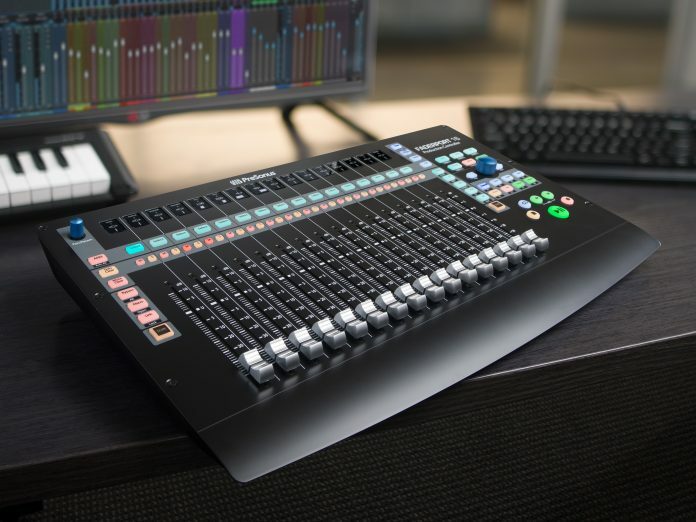 The third model in the FaderPort series, the new control surface offers full level, solo, and mute control over 16 channels at once, with 16 touch-sensitive, motorized, 100 mm faders, and 89 buttons covering 102 different functions. Quickly zoom in on audio files for editing, modify plug-in parameters, manage aux mixes—and, of course, control track levels with the touch of a finger. The FaderPort 16’s unique Session Navigator provides easy access to eight mission-critical functions for maximum flexibility. Dedicated buttons are provided to instantly arm all tracks for recording; control mutes and Solo Clear; view only the tracks, buses, and VCAs you want to see; and more. You’re not limited to preset controls, either: Four programmable User buttons let you quickly and easily access your favorite functions. Large, illuminated buttons make finding the function you need quick and easy. Sixteen digital scribble strips provide visual feedback. Streamlined workflow and support for the Mackie Control and HUI protocols make it fast and easy to control virtually any DAW. No driver installation is necessary; just plug the control surface into a USB port and take command of your mix and plug-ins. When used with Studio One®, the FaderPort 16 is a revelation, letting you do things like bypass all the plug-ins on any track with one button-press and open the Channel Editor and enable your faders to control each channel’s custom macro. Use the Control Link feature so that the Pan/Param encoder can follow your mouse, providing instant hands-on control of any parameter—or lock the encoder to the current parameter. Use the Session Navigator to quickly scroll through the different sections in the Arranger track; and more. You’ll be amazed how much faster you can work. The FaderPort 16 is available at PreSonus dealers for a U.S. street price of $999.95. For more information, please visit www.presonus.com/products/FaderPort-16.